Making a clay pot holiday planter is a great way to chase away the winter doldrums. Kids love to paint these pots. They can paint the pot a base color and then use stickers or whatever their imagination lets them do. They make great gifts for family and friends. These clay pot planters make wonderful gifts for your garden friends as well as beautiful decorations for you home. You donâ€™t have to make them a Christmas planter. Make a few at the same time and you can fit any season. The one pictured here is for the Christmas season because I love them in the house with flowers. They look very nice with your Christmas cactus or poinsettes. If you are going to use real flowers in the pot then you need to seal it first. The moisture from the inside will make your paint of the outside come off if you donâ€™t seal it first. Let the sealer completely dry before you proceed. You do not need to seal it if you are just going to use silk flowers or candles. Paint the base color on your pot. You may need 2 coats. Let it dry and then paint your design. You can freehand your design, trace it from a picture or else you can use stencils. For a different look, you can paint the rim of the pot a different color or else sponge paint the rim shown on the picture for a textured look. For this pot I used a Christmas stencil. Secure the stencil onto your pot with tape. You can use acrylic paints or stencil paints. The stencil paint is thicker and wonâ€™t drip. Paint your design and then let it completely dry. Using your sponge dab the rim with your first color and then follow up with your different colors. Let the paint dry a little between colors or else you will have what they call mud. If you are going to use live plants then you will need to seal it again. 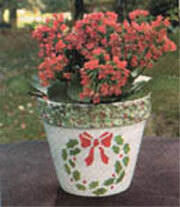 You are now done and the clay pot holiday planter is ready for anything you want to use it for. You can make clay pot holiday planters for any occasion. They make great Valintines planters as well as fourth of july, Thanksgiving and great shower planters. All you need to do is change the design you put on the planter.